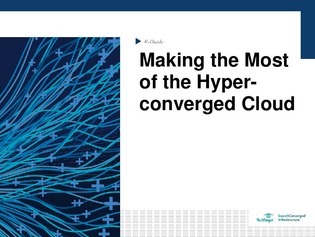 Hyper-converged clouds: you’ve heard the term, but what does it mean? Unfortunately, the term differs per vendor: it can be applied to a public cloud provider using HCI, an on-premises hybrid cloud using HCI, or even a system that links the virtualization in an enterprise HCI system with a public cloud's own virtualized servers. This expert guide from SearchConvergedIT.com will help you navigate the new space. Download your copy now to make the most of the hyper-converged cloud, learn how vendor offerings differ from one another, and view one such product— Cohesity CloudSpin—that provides developers with quick access to back up data in the cloud for test/dev.